An advisor comes to inspect Kerry's childminding business. The advisor isn't convinced at Dorothy's allegations, but will send a psychologist out anyway. Caroline and Christina discuss asking Paul to stay on at their house permanently. Caroline isn't keen though - working and living together can lead to problems. Dorothy sees Helen on the street. 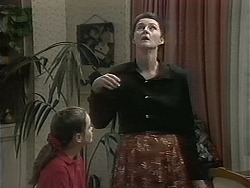 She tells Helen that there's a serious problem with Kerry and Joe's childminding situation, but Helen won't believe it. Dorothy goes on to say they have marital problems and an alcohol abuse problem! HELEN: That doesn't sound right. Joe and Kerry are decent, trustworthy people. Children can be a little trying at times. DOROTHY: It simply must be stopped! HELEN: I'm sorry, but I can't accept what you're saying. I've seen Kerry with the children, she has a wonderful relationship with them. DOROTHY: Well, I'm sure the psychologist will uncover the fact. Helen is flabbergasted by Dorothy's allegations. Joe and Kerry are trying to persuade Natasha to tell them how she got her black eye. She refuses to dob Lochie in though, saying she just hit it on the table. JOE: If that's the truth, I'm a Dutchman! KERRY: Well, she's definitely hiding something. KERRY:(getting upset) How could Dorothy Burke imagine that I'd hurt a child? JOE: Cos she's an evil-minded old cow, that's how! Kerry is worried that the advisor is sending in a psychologist, but Joe says the advisor was just being on the safe side. JOE: Look, no-one's going to get away with accusing you of anything. We'll sort it out! Paul has got some Chinese takeaway for him and the twins. While they're eating, Caroline hints about Paul moving back to Lassiter's, but he says he's thought about it and he's not going to. He thinks it's miserable being in a hotel suite, so he'll look for a flat. But the Christina tells Paul he's welcome to stay on as long as he likes. Caroline doesn't look too happy at this though. Dorothy, Ryan and Lochie are having breakfast. She fusses over Ryan - she wants to buy him some new school shirts at lunchtime. Lochie wants to go back to Kerry's after school - she likes it there. She admits that she hates Natasha though. LOCHIE: She deserved that black eye. I hate her. 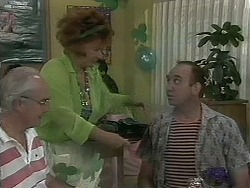 Dorothy makes Lochie tells her how Natasha got her black eye. LOCHIE: I only thumped her once - it was her fault and she deserved it! Kerry is on the phone to the mother of one of the children she babysits - she's decided not to use Kerry anymore. Kerry is upset - Dorothy has been spreading rumours. JOE: I can't believe this. It was bad enough getting the authorities in, but ruining your reputation? I'm going to sort this out. I might even give her a black eye of her very own to worry about! He starts to storm off, but comes back, realising there's nothing he can do. Gloria is collecting dishes from her mates. He wants an Irish Coffee - he's brought his own whisky. Dorothy and Ryan come in with a lot of shopping bags. Dorothy says she's feeling a bit off-colour. Gloria tells them she's run off her feet now Lee's done a runner, and Ryan suggests that he could work in the Coffee Shop instead. Gloria is very pleased. Caroline is telling Christina that she's not sure about Paul staying with them. She says that Christina feels sorry for Paul - and most of her boyfriends have been guys that she started off by feeling sorry for. But Christina says she's not interested in Paul - and anyway, Caroline herself has been out with people she met at work before. CAROLINE: OK. As long as we agree on the ground rules. No romantic involvement. CHRISTINA: Alright. Strictly hands off. Natasha's mother (Paula) has come round to see Kerry. She's come about Natasha's eye. Apparently her mother has got the truth out of Natasha - it was Lochie that hit her, but Natasha provoked her. Also Natasha has stolen Kerry's earrings which she now gives back. 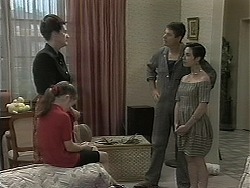 Natasha's mother is contrite, and offers to take Natasha to another child-minder. But Kerry assures her that Natasha can keep coming to her after school. PAULA: Well, I'm very grateful. Good child care's hard to find. 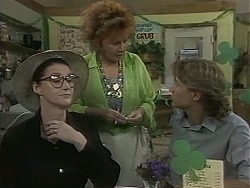 Paula's mother takes Natasha off to have a good talk to her about "acceptable behaviour". 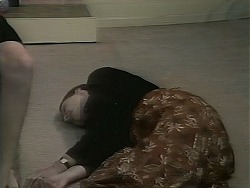 When they've gone, Kerry is relieved, but Joe says they still have to sort out Dorothy Burke. Ryan has arrived for his first after-school shift and Gloria is showing him the ropes. All the girls are eyeing him up and laughing. Ryan looks like he's quite enjoying the attention(!) as he takes their orders. Helen has popped round for a cup of herbal tea with Kerry. She tells her about Dorothy's allegations when she spoke to her this morning - Dorothy has been spreading stories. Helen says Dorothy stopped short at an accusation, but said a lot of terrible things about Kerry. Kerry is upset - her reputation is being ruined and there's nothing she can do. The girls have got a bit much for Ryan - he's hiding in the kitchen. Gloria laughs and tells Ryan to be polite and keep things under control at the same time. Ryan goes out to have another go. Caroline and Christina ask Paul if he'd like to stay on at the house. Paul thinks things might get complicated, but eventually agrees. 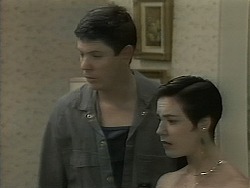 Joe and Kerry answer the door to Dorothy. JOE: Oh, it's the old bat! 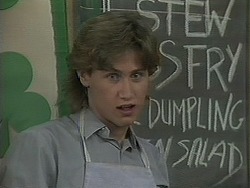 KERRY: Mrs Burke, what do you want? DOROTHY:(barging in) May we come in? There's something I have to say to you. Dorothy has taken off her glasses and her hat - she's come to apologise most sincerely for the trouble she's caused them. Lochie has confessed to hitting Natasha. DOROTHY: I am so sorry, believe me. I do tend to protect my niece, but I am also prepared to admit when I have been wrong. JOE: Oh, good for you(!) Doesn't help to patch up Kez's reputation though does it?! Lochie explains that Natasha threatened to thump Sky and therefore she got in first. But she felt that she couldn't dob before now. Kerry suggests that they put it all behind them and make a fresh start. DOROTHY: That's very gracious of you. Dorothy doesn't look too well - and suddenly she faints!